These days, the Santa Monica Farmers’ Market and other farmers’ markets in California provide us with fresh, seasonal cauliflower. 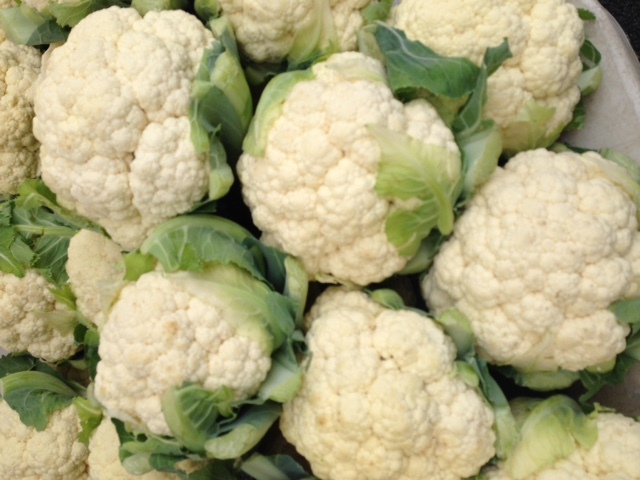 Cauliflower is high in Vitamin C, low in carbs and fat and rich in dietary fiber. The longer cauliflower is cooked, the more its nutritional value dissipates. Therefore, it is recommended to cook this vegetable until it is barely “al dente” or crunchy-tender. Try this exciting cauliflower salad, flavored with olive oil, lemon, bits of fresh oranges, raisins and fresh oregano. Serve it at a barbecue, lunch or dinner this summer. Vegan or not, they’ll all chow down this colorful, healthy salad in minutes! 1. Place the cauliflower florets in a 4-quart saucepot; barely cover with cold water. 2. Cover the sauce pot and bring the cauliflower to a boil. 3. Boil the cauliflower for approximately 2 minutes. 4. After 2 minutes, pierce one cauliflower floret with a fork to check for tenderness. Do not overcook the cauliflower. 5. If fork resists piercing, it means the cauliflower is still raw. If needed, cook for an additional 1 or 2 minutes. 6. After 1 minutes, check doneness of cauliflower with fork and/or taste it. The cauliflower should be “al dente” or crunchy-tender. 7. Drain the cauliflower in a colander set over a sink. Let it cool slightly, for 5 minutes. 8. After 5 minutes, transfer the drained cauliflower to a glass or porcelain serving bowl. 9. Add the olive oil, lemon, salt, pepper, raisins and fresh oregano leaves. Stir to combine. 10. Taste the cauliflower salad and adjust seasonings, if needed. With okra in season, why not prepare a delicious pasta dish for our upcoming July 4th celebration? While stewing the okra and tomatoes, the rigatoni pasta cooks in minutes – just add it to the okra in skillet. Enjoy and have fun! 1. In a 12-inch skillet, heat the oil on medium-high setting. 2. When oil is hot, add chopped onion; stir-fry onion for 2 to 3 minutes or until it is translucent and turns light golden brown. 3. Stir in the okra; cover and cook on medium heat for 1 to 2 minutes. 4. After 1 to 2 minutes, stir in the wine; cover and cook for an additional 2 minutes. 5. Meanwhile, bring a 4 to 5-quart sauce pot of water to a boil – keep water aside at a low boil. 6. After the okra and tomatoes have cooked 2 minutes, stir in 1/4 cup water, salt and black pepper. 7. Cover and stew the okra and tomatoes on medium-low heat for about 2 to 3 minutes. 8. Meanwhile, add the rigatoni to the boiling water; cook according to package directions – 8 to 10 minutes or until “al dente” (crunchy-tender). 9. While pasta boils, set the skillet with okra and tomatoes aside on a cold burner or on a countertop (this will ensure that it will not dry out). 10. When pasta has is cooked, drain it in a colander, reserving about 1/2 cup of the cooking liquid. 11. Bring the okra and tomato stew to a simmer. 12. When okra and tomatoes simmer, stir in the drained pasta and 1/4 cup of the reserved cooking liquid. 13. Stir and heat through on medium-high heat, reducing the liquid a little. If more pasta cooking liquid is needed, add 1 to 2 tablespoons more. NOTE: The pasta and okra mixture should not be soupy. 14. Divide the rigatoni, okra and tomatoes among 4 to 6 dishes. Ask guests to add some grated Pecorino Romano or Parmigiano Reggiano cheese and some crushed pepper to their rigatoni dish (optional). 15. Serve this pasta dish with chilled Chardonnay or Pinot Grigio wine (both are white wines). Peas with Grappa? You better believe it! During the early summer months when I lived in Italy, bushels of pea pods would be delivered to our kitchen. We then went to the garden for onions and whatever ingredients might add color and flavor to our pea recipe. In this case, we used red bell peppers and thyme. But the best was yet to come – the peas were spiked with Grappa. As a side note, here’s my favorite Grappa – Poli Grappa®. It’s from Bassano del Grappa in the Veneto region of Northern Italy. Poli Grappa® is smooth and goes down like a sweet fire. However, for cooking purposes, you may want to save some bucks and buy inexpensive Grappa found at Trader Joe’s® Stores. I hope you enjoy this exquisite side dish of Peas, Grappa & Thyme. 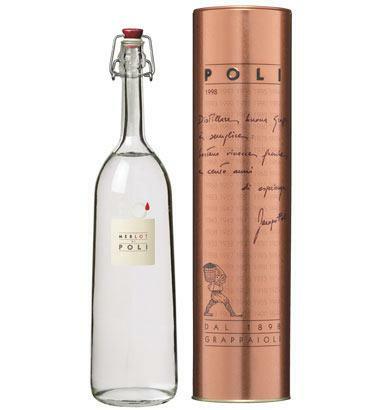 Don’t forget to end the meal with a shot of Poli Grappa®. 2. When oil is hot, stir fry the peas on medium-high heat for 30 seconds – do not let them turn golden. 3. Add the chopped onion and bell pepper. 4. Stir fry the mixture on medium-high heat for 1 more minute or until onion is translucent. 5. Add the Grappa to the pea mixture and stir fry 1 more minute. 6. If mixture dries out, add 1/4 cup of broth or water and stir fry for 1 more minute. 7. Stir in salt and black pepper, to taste, followed by the thyme leaves. 8. 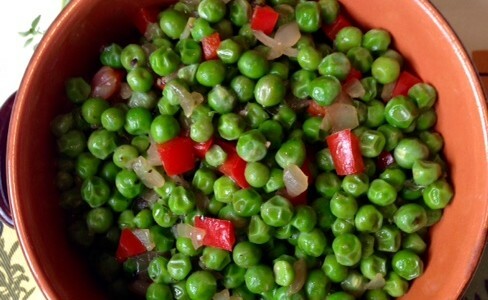 Serve peas as a side dish to fish, poultry or meat. Alternatively, add this dish to a vegetarian feast. *Grappa is an Italian alcoholic beverage made from the distillation of skins, pulp, seeds and stems (the “pomace”) leftover after pressing grapes in the winemaking process. Grappa is therefore a fragrant pomace brandy. The flavor depends on the quality of the Grappa. Although most of us are dieting this month, just remember that you don’t have to eat soup for the next 30 days. And, diets don’t have to be boring either. By now, you all know that my vegetables are loaded with good ingredients and great flavors. This recipe requires fresh zucchini, onions, tomatoes and oregano. 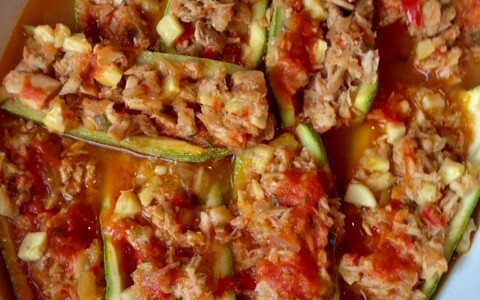 When combined with tuna, you’ve created Zucchini-Tuna Boats which taste heavenly! You can make these ahead and keep them refrigerated up to four days. 1. Using a long knife and working on a cutting board, cut each zucchini in half, lengthwise; set aside. 2. With the tip of the knife, cut all around the inside of the zucchini-half (1/8-inch inside rim) and gently scoop out the flesh; set flesh aside in a bowl. 3. Continue scooping out the zucchini flesh with remaining zucchini halves; set aside. 4. In a 12-inch skillet, heat the olive oil on medium-high setting. 5. When oil is hot, add the chopped onion and stir-fry for 1 to 2 minutes or until onion is translucent. 6. When onion is translucent, add 2 cups of the chopped tomatoes and stir-fry on medium-high setting for about 3 to 4 minutes or just until the tomato begins drying out (do not let it dry out completely). 7. After 3 to 4 minutes, stir in the drained tuna. 8. Stir-fry the tuna-tomato mixture for about 3 to 4 minutes or until it looks amalgamated and not so runny. 9. Add the oregano, salt and pepper. Taste and adjust seasonings. 10. Set the tuna-tomato mixture aside to cool for about 5 minutes. 2. Lightly coat a 12 X 16-inch rectangular baking dish with remaining 3 tablespoons olive oil. 3. Spread 2 cups chopped tomatoes over the olive oil in baking dish; lightly sprinkle with salt and ground black pepper, to taste. Set aside. 4. Divide the tuna-tomato mixture evenly among the 12 zucchini boats. 5. As you fill the boats, place them, side-by-side in baking dish. 6. When all zucchini boats have been stuffed, spread the remaining 1 cup chopped tomatoes over stuffed zucchini boats. 7. Cover the baking dish with aluminum foil and bake the Zucchini-Tuna Boats for about 25 to 30 minutes. 8. Serve the Zucchini-Tuna Boats immediately or at room temperature. *NOTE: If using albacore white tuna, the filling will become dry. Moussaka is an eggplant dish from Greece and Turkey. In Greece, it is layered with ground lamb and served hot. 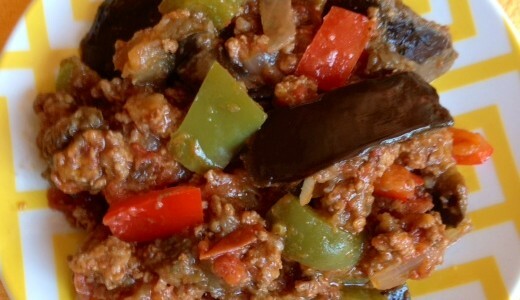 In Turkey, the eggplant is stewed with lamb and served warm or at room temperature. In honor of Thanksgiving, I’m making eggplant moussaka from Turkey. It contains ground meat of the same name – lol! For those of you who are vegetarian, simply omit the ground turkey. Bon appetit! 1. Line a 12 X 18-inch baking sheet with aluminum foil; brush foil with olive oil and set aside. 2. Cut off and discard top and bottom of eggplant. 3. Cut the eggplant into 1/2-inch thick slices and place the on foil-lined baking sheet (previously oiled). 4. Cut the tomato in half and place it (cut-side up) alongside eggplant slices on baking sheet. 5. Brush the eggplant and tomato with olive oil; lightly sprinkle each with salt. 6. Place the baking sheet on a rack positioned 6 to 7 inches away from top broiler element inside oven. 7. Grill the tomato and eggplant for approximately 8 minutes or until eggplant has turned golden brown. 8. When eggplant has turned golden brown, wearing oven mitts, transfer the baking sheet to a counter. 9. Transfer the tomato pieces to a bowl to cool. 10. Turn the eggplant slices over; brush them with olive oil and sprinkle lightly with salt. 11. Grill the eggplant slices (on other side) for 6 to 8 minutes or until they have turned golden brown. 12. After eggplant is done, set the baking sheet to a counter; transfer eggplant slices to a plate to cool. Set aside. 1. Heat 3 tablespoons olive oil in a 12-inch skillet. 2. When the oil is hot (do not let it smoke), add the ground turkey (or lamb). 3. On medium-high heat, stir-fry the meat, constantly breaking it up with a wooden spoon. 4. Add the garlic, onion and chopped peppers. 5. Cook the mixture on medium-high heat, stirring occasionally, until the onion is translucent, about 2 to 3 minutes. 6. When onion is translucent, stir in the diced tomatoes and tomato purée. 7. Cook the moussaka for about 4 to 5 minutes, stirring occasionally, until the tomato sauce has thickened. 8. After 4 to 5 minutes, stir in the vinegar, sugar, salt, pepper and nutmeg. 9. Cook the moussaka for 5 to 6 minutes longer. Taste and adjust seasonings. Butternut Squash Risotto (see recipe index – Pastas, Rice & Legumes).